The crisp, cool night air. The crunch of warm-hued leaves under my feet. The honking of the Canada Geese as they fly low overhead. So close, I can hear the "flup, flup, flup" of their wings as they gather into huge V-shaped convoys. Hundreds of the majestic birds take to the skies from the lake across the street from our home, covering the sky during their dawn and dusk pilgrimages. "Damn you stinking birds!" I yelled to the sky, shaking my fist at the noisy flock above. Then I asked myself why the hell I was facing skyward, mouth open, a perfect target if there ever was one. Fall is my favourite time of the year too ! It's a very beautiful day today here in Southern Ontario. Cool and Clear. Should've called in Sick. Poopy birds ? Tell me about it - I am at war with pigeons. I had my dad install a net around my balcony two summers ago. Yeah, I hear ya...I work not to far from Puget Sound, and b/t the crows and the seagulls, my car has seen more than it's share of poop. I now travel w/ a roll of paper towels in my car!!! I never knew that Geese had irritable bowel syndrome while in flight. Gives a new meaning to the term 'Carpet Bombing'. Well, the story started out nice anyway. I think I just saw your geese fly by my office. One of them had a smirk on his face. Ewwwww...I hate bords, Geese especially. I'll have to tell you about the time I was attacked by Canadian Geese. Twice. As I was reading, I was thinking how lucky you are to be living right across the street from a beautiful lake. The water. The trees. The birds. Yikes! The birds! What a great story. That'll teach you to be humble in the presence of nature. LOL. Lotus07: IBS Geese. It certainly LOOKED like it. Babs: You know me too well. Aw, thanks Swubird. Yes, nature certainly has a way to keep us humble alright. That and careful where we step. Ick! Well, at least you got to see birds! SEE! I hate to tell you I told you so, but I told you so: geese are a hazard. They should be wiped from the earth. Preferably stuffed, and with baked potatoes. The moment passes quickly, doesn't it? Be.Bart: How did I KNOW you'd comment on this one???? What was going thru my head when I discovered these presents???? YOU and your damn pants. Yes. You DID tell me so! Ed: Way too quickly. I think I'll enjoy the outdoors safely from my blogging chair in the livingroom. Ewwwwwww. Thank God you closed your mouth hon. That would have been soooo bad. It's all part of the trickle down economics. You are then going to go out hiking or campign and have to pee and some poor bug is going to be thinking "Aw, man, I curse you human!!!" Jo: Ick. I get nauseous just THINKING about that. Janet: Gross! Is this where I make the lame comment "But isn't it considered good luck?" to make you feel better???? LOL ... yes, and I live near the lake, that's their take of and landing point! I feel your pain. I keep a bottle of Windex wipes in my car. Eeewwww! HAHAHAHA! Oh, I'm with you! Completely! We've just forced a neighbouring farmer to trim a tree back which hung over our property and our roof and was full of dead wood. Branches would fall on our driveway, narrowly missing our cars. 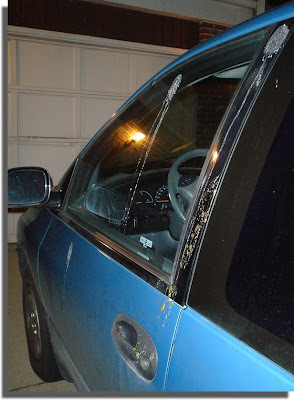 The fact that birds can no longer poop directly onto our vehicles is a bonus! I am here via the black box. Funny post. I remember when a bird pooped on my brother's car and he chucked a rock at it. Down it fell...dead! We were horrified at him. Bird Killer! I don't think he really expected to hit the bird. I think it was a little sparrow or something. I was little but it made a big impression on me. Yikes! Right on the door handle. Tara: Now THAT's a great idea! Lady Banana: This is true; see? You are an optimist... things can ALWAYS be worse! Well, they had time for yours I guess. Johnny's Mommy: They sure did. And they didn't even have anywhere to perch! This came all at once while flying over; and no where else on the driveway. Damn geese had some perfect aim.